Indoor house cats are not very different from cats that have experienced the outdoors. We think they don't have a clue as to what they are missing, but maybe they do. Would they like to be outside? Of course. Will they settle for their life inside? 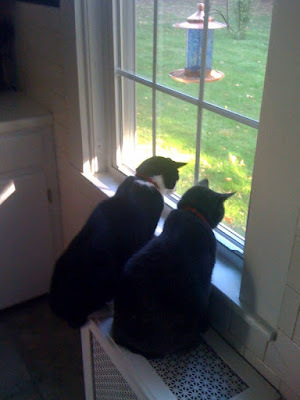 As long as they don't know what they are missing, and they can experience the great outdoors at a window as if they are watching a cable channel for cats, they'll be fine. Unfulfilled, but fine. For a house cat anything seen through the window is worth watching. Sometimes its "The Leaves Moving On the Grass Show" followed by "Birds At The Feeder". There are countless moments performed through the glass. "Chipmunks On Parade" is one show they will actually follow from window to window around the house. It is that good. Actually, chasing a chipmunk outside the glass would be a far better experience for them, but what they don't know... . And, if they did know, well, there would be no holding them back. Same principles apply to people, too. They watch life through a window, and from a distance, and don't wonder what it would be like to participate in that moment they are watching, because, in their world, they are. Some of us finally do escape, and dash between the legs of the guards to the outside, breathe deeply, and do the "Happy Dance" on the front lawn. Embarrassing to watch, but incredible to do. What drives us to that break-free-moment is different with each of us, but so worth it. Think about making a break from your routine. You can always return, but each time you make a break, it will be for a bit longer, and enjoyed more. How this will effect your daily routine, your relationships, your job, your family is any ones guess, but I am sure it will all be positive. Start small. The next time you are driving back from Shaw's head down 131 to I-84, get on the interstate, and head south for four exits, get off the interstate and then find your way back home by the back roads. You will get home, but the sights, the scenery, the experience you will will have had along the way will be a hundred times better than the routine trip to market. It's a small escape, and except in time, and a bit of gas, it cost you nothing, but will worth far more than you can imagine. Each day, take a little step outside of your routine, outside the glass. Go, find your chipmunk. So, are you taking the cats to the polls or did they vote absentee?